Orangutan’s hair is typically reddish-brown, instead of the brown or black hair typical of other great apes. They are the only living genus of great ape that is exclusive to Asia. They are among the most intelligent primates and use a variety of sophisticated tools. They also make sleeping nests each night from branches and foliage. Orangutans are the largest living arboreal (living in trees) animals with longer arms than any other great apes, in fact, orangutans arms are twice as long as their legs. Their fingers and toes are curved, allowing them a better grip on branches. Fruits make up 65-90% of the orangutan diet. Fruits with sugary or fatty pulp are favored. Ficus fruits are commonly eaten, because they are easy to harvest and digest. Orangutans are opportunistic foragers and their diet may vary monthly depending on the available of food. Bark is eaten when other foods are scarce. Conservation Status: Critically endangered. Native to Indonesia and Malaysia, Orangutans are currently found only in rainforests on the islands of Borneo and Sumatra, though fossils have been found in Java, the Thai-Malay Peninsula, Vietnam and China. There are only two surviving species, both of which are endangered: the Bornean Orangutan, Pongo pygmaeus, and the critically endangered Sumatran Orangutan, Pongo abelii. 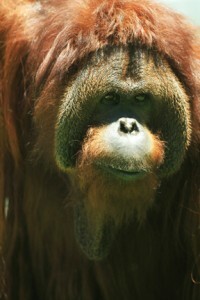 The word “orangutan” comes from the Malay words “orang” (man) and “hutan” (forest); hence, “man of the forest”.